What features are offered on different models of chiropractic tables, particularly adjustment tables? Depending on the specific type of chiropractic table you are considering, there are a wide range of possible options and features. Most come with several different choices of upholstery colors, typically with a neutral colored base or frame. Some of the stationary types of chiropractic adjustment tables also include hardwood legs instead of the traditional steel and powder coat frame options. Most chiropractic tables will include armrests as part of the standard table features, although the shape and position of the armrests can vary from design to design. Paper roll holders, cutters and options of thickness in padding and foam on the table are also common features that vary between tables. Some tables also offer tilt or articulating headpieces that are idea for patient comfort and easy positioning. Adjustment tables can vary in length, width and height with some offering the option to adjust the table up and down while some come built at a standard height, usually 22 inches. Other differences between tables can include the manufacturers warranty which, in some chiropractic or traction table models, can include a limited warranty of up to five years. Despite the various options and features between tables the price range is fairly consistent for these basic chiropractic tables. 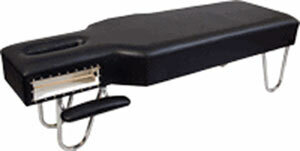 Shopping online can help in reducing the cost of the equipment and getting the best possible deal. Are there portable chiropractic tables that are lightweight and easy to move from room to room? 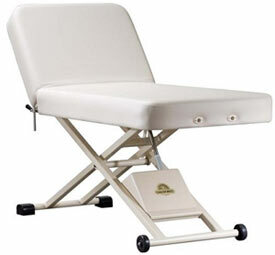 Portable chiropractic tables are designed to be easily folded and moved by just one person. These tables are great for use in a variety of patient rooms or for those that work out of their office at hospices, nursing homes or community based medical programs. These tables are designed to be sturdy and long lasting, even if they are routinely moved from location to location. The features for portable tables are similar to standard tables, allowing the chiropractor to have the same support when working with patients regardless of the location. I know there are a variety of different models of chiropractic tables that offer both flexion and decompression. What are some of the features of these types of tables? As with most types of medical equipment, there are different features offered in chiropractic and traction tables that offer both decompression as well as flexion possibilities for patient treatment. Some tables offer tables that are designed to accommodate for both manual flexion and distraction as well as automatic flexion and decompression. These tables typically include the features such as a tilting headpiece that provides options for a wide range of head and neck positions. A thoracic release will also be an important consideration with this style of table as is an optional auto-flex feature. The ankle extension feature provides additional support for the patient as well as allows for greater stretch options. These types of tables also have all the additional features you expect. This includes arm rests, foot controls for height and positioning as well as a choice of upholstery colors to match your décor and color scheme.